"Finding the Extra in the Ordinary"
In the month of September, I'll be having a 2-person show with Carol Sanzalone at the Artists' Gallery in Lambertville. 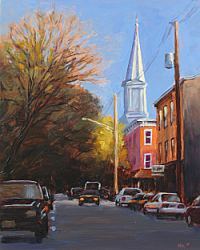 I'll be showing my usual landscapes, with a few Lambertville street scenes that I've been saving for this show. Actually, my work will feature more buildings and signs of human habitation than usual. I guess I've been spending less time in the woods this year. I've also gone a bit smaller with some paintings and will be showing a group of 5x7" works - that's in addition to my usual range of sizes up to 18x24". 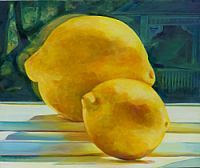 Carol paints landscapes and still lifes with watercolor and acrylics. Between Carol's water media and my oils, and our different interpretations of the local landscape, I think we'll have a good show and each body of work should compliment the other very nicely. The opening reception is Saturday, Sept 8, 6-9pm. We'll also be holding an artists' talk on Sunday, September 16th at 2:00pm, where Carol an I will discuss our work and influences, and we'll be happy to answer any questions. Refreshments will be served.